Neal Stephenson is thinking big - 20km (12.4 miles) big, to be precise. That's how high the tower he has proposed building will soar if the project ever comes to fruition. Such a structure would make it cheaper to launch objects into space, he says, thanks to fuel savings. It's a lofty goal. But creating a building more than 24 times taller than Dubai's Burj Khalifa and not far off double the height commercial aircraft fly at is no easy task. "It ends up being all about wind," the author tells the BBC. The idea of creating a building that would soar into the freezing heights of near-space involves many practical challenges. First efforts to envisage such a structure resulted in a design whose base covered more than 10 sq miles and whose bracing members at the lower level would each be longer than any existing bridge. Early estimates, created to illustrate the scale of the task, suggested up to 985 million tonnes of steel might be required - the world's entire steel output was only 1.55 billion tonnes last year. Those involved are now exploring the idea of building sections out of different materials. Perhaps a bigger issue is that the structure needs to withstand jet-stream winds of more than 500km/h (310mph). One idea to achieve this is to mount aerofoils on to its exterior - effectively wings that would use air pressure to create lift - in order to "fly" the upper floors through the wind. Another proposal involves attaching rocket jet engines to the building's walls. One researcher estimated that the structure would need about 700 F-1 engines - as used in Nasa's Apollo programme - to work, so another option may be needed. "We are some distance from understanding the jet stream well enough to manage the natural risks associated with structural integrity," adds Prof Keith Hjelmstad. "And the technical aspects are only a part of the question. Selecting a site out of the way of conflict and raising the capital required to build it are, in our current world, probably just as difficult." Even if all these obstacles are overcome there remains one further hurdle. With estimates of the cost spiralling up to $1 trillion, Mr Stephenson half-jokes that it is not clear how the owners would ever get insured. 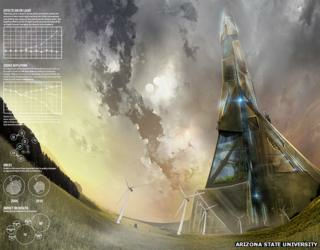 "In a windless environment making a structure that tall would almost be trivial. But when you build something that is going to poke up through and get hit by the jet stream from time to time, then it becomes shockingly much more difficult." Stephenson studied physics before becoming a writer, and his fascination with the way science and technologies develop is a central theme in much of his work. His fiction has explored cryptology, computer hacking, virtual reality, video game economics and consciousness, while his essays include an epic investigation into how the internet works and a study of the rocket industry. Former Microsoft executive J Allard used to insist everyone in the Xbox development team read Stephenson's cyberpunk novel Snow Crash. Amazon founder Jeff Bezos employed him for a time as an adviser to his Blue Origin spaceflight company. The New York Times once described him as a "seer". Stephenson may be highly regarded, but his Tall Tower project only came about as a consequence of being criticised. At an event in 2011, a university chief accused the author and other science-fiction writers of failing to pull their weight because they had not come up with big ideas to inspire researchers in the way Arthur C Clarke and Jules Verne had done earlier. The shaven-headed author's response was to ask: "How tall can we build something?" "The idea of the project in general is to come up with innovations or ideas... sufficiently near-term and doable that a person sort of graduating from university today could say, 'Well, if I began working on this now, then by the time I retire it might exist'," he says. "I was at a conference a few years ago where I ran into an incredibly bright man who in another age would have been laying a transatlantic cable or building the first aeroplane or something. And he was spending all his time writing spam filters. "I'm sure it was incredibly demanding mental work and quite valuable - but it just struck me that in a way it seems as though our scope has been reduced quite a bit when the brightest people of the generation are writing silly little apps or spam filters or what have you. "So, this is just a somewhat playful, somewhat serious attempt to just raise that issue and get people talking about it." The initial plan was to create a steel-based design rather than resort to imagined futuristic materials, in order to prevent others dismissing the scheme as pie in the sky, he adds. But the scale of the problems caused by the wind have caused him and his partner in the project - Keith Hjelmstad, professor of civil engineering at Arizona State University - to "hit the pause button" while they re-examine the forces involved. In the meantime, Stephenson has had time to ponder recent leaks about the National Security Agency's surveillance techniques. The writer was born in Fort Meade, the NSA's home, and his novel Cryptonomicon features a character who founds the agency, using an early supercomputer to decrypt secret messages. Speaking to the BBC at Edinburgh's Turing Festival, Stephenson says he is reassured by the fact that the technologies that make the NSA "so scary" have also been used by whistle-blower Edward Snowden to shed light on its inner workings. "He's a kind of a sign that the system is working, which doesn't do him any favours, but it makes me hopeful that people won't be able to keep such programmes absolutely secret indefinitely," he says. But he adds that no-one should be shocked by what has been disclosed. In 2010, Time picked Snow Crash as one of its top 100 books published since the launch of the magazine in 1923. The novel - featuring hackers and a computer virus that can kill infected users - helped popularise the concept of virtual reality. But while some of its themes went on to feature in the Matrix trilogy, many believed Snow Crash itself to be unfilmable. That changed last year when Joe Cornish - the British director of Attack the Block - announced he was adapting the book. "I didn't really think it was possible," says Stephenson, who adds he believes the script is "amazing". But he warns that is no guarantee it will ever be made. "I believe it is being thought about by people I don't know and will probably never meet," he says. "Someone in Los Angeles has it on their stack of important decisions to make and it will either get kicked back for revisions or maybe something will start to happen." "I don't know how to take those claims. Are they being sort of disingenuous? Did they really not believe such things were going on? "Every thriller, book and movie that has come out in the last quarter of a century has featured people in an underground CIA or NSA bunker doing exactly this kind of surveillance and using it to catch bad guys or good guys. "When the Boston Marathon bombings happened a few months ago people claimed to be furious that the [bombers] hadn't been detected and prevented from carrying out their schemes. "So, there seemed to be a public will demanding exactly the kind of surveillance measures that Snowden was leaking. And to sort of make those kinds of complaints and then turn around a few months later and claim to be shocked that such efforts are going on seems to be a bit fishy." Following his most recent book, Reamde - a present-day cyber-thriller, Stephenson says he has returned to the past to tap a "similar vein" to that covered in his globe-spanning Baroque Cycle.